The Marquette Hotel and Rooming House was a large two story frame structure where miners kept rooms. It was located west of Denton's Grocery and People's Cleaners and can be seen in the first view on the first page. 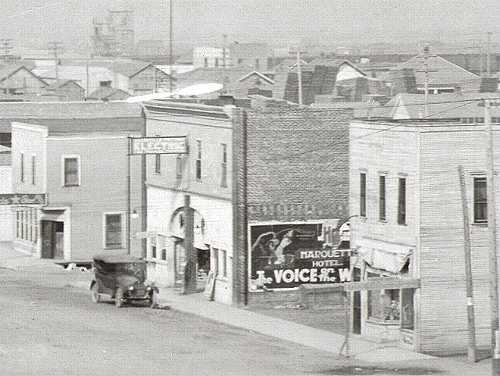 The next building is the Electric Theater and at the far left is the Star Cafe. 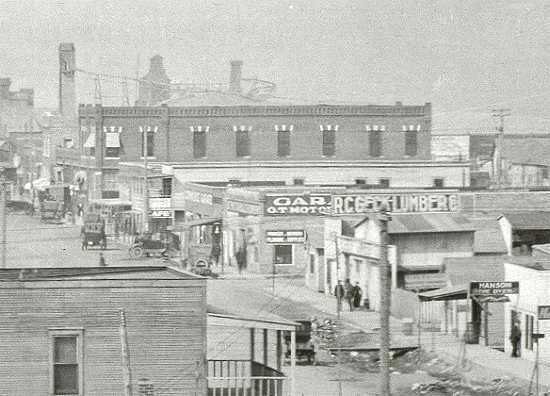 In this view, looking further west is a store called "Hanson's" , another lumber yard, a garage called O. T. Motor Co., a cafe, and the large building is the bank building. The mines and mills of Commerce loom in the background. These pictures are small segments of a much larger picture and are greatly enlarged. I would suspect that this is the first time these views have been presented anywhere.